Carolyn Gaines passed away last week. Carolyn was a fellow parishioner at Holy Comforter Episcopal Church. I believe we may have met in person once, but our connection was established when we began exchanging “snail mail.” For her birthday (I think it was her 85th), we were all encouraged to send her cards, since she valued snail mail so much. I sent a card and got back a lovely reply. 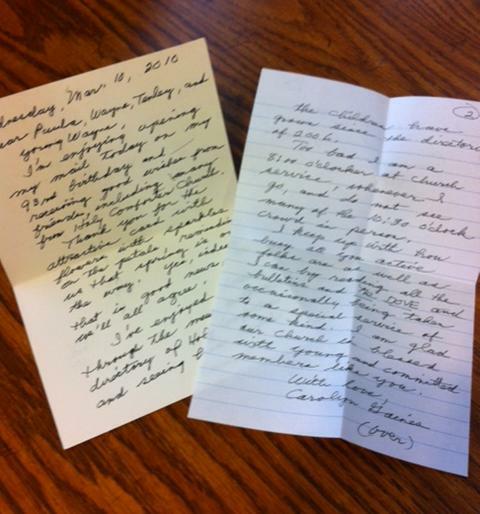 Over the years, every response of mine was returned with a lovely note from Carolyn. Carolyn’s passing got me thinking of snail mail and the ways in which email just isn’t the same. For me, writing a traditional letter forces me to retrieve a different set of writing tools, especially if I am writing by hand but even if I am typing a letter that will be printed and mailed. I discovered this most recently when I participated in the “Snail Mail My Email” project. SMME is “a worldwide collaborative art project where volunteers handwrite strangers’ emails and send physical letters to the intended recipients, free of charge.” Admittedly, when I volunteered I focused on the “handwrite” component instead of the “art” part. I hope the recipient who requested a “gray striped cat, turnips, and a gingko leaf” appreciated my efforts which were pretty amateurish! It is tangible. You can hold it in your hand. I still love the thrill of paper in my hands. My friend Kathleen is a true “snail mail only” person. My family knows that if the mail contains a letter from Kathleen, all activity will come to a standstill until I devour it. I am pretty sure Kathleen is this generation’s Erma Bombeck. I hope all her great material gets compiled into a book someday and makes her a million bucks. We’ll be able to say we knew her when (and heck we may be able to sell her old letters on eBay (just kidding….)). 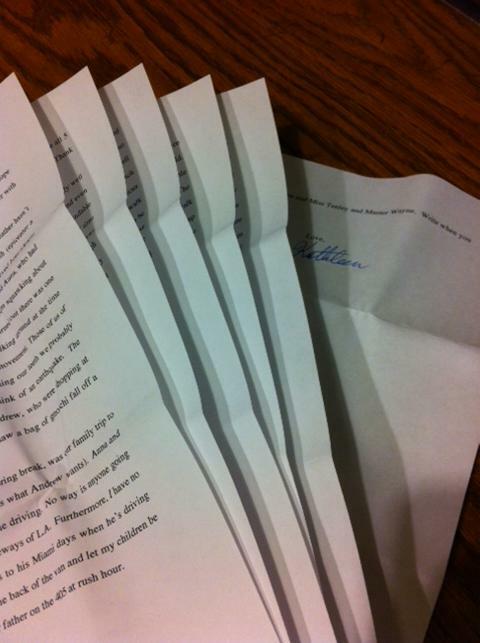 Letters from Kathleen are always a treat! Who among us hasn’t tapped out a lengthy email missive to a friend, analyzing the day’s events with its frustrations and high points? Or a lengthy email missive to a friend, written with no filter in a moment of anger or frustration, that went beyond a “venting” session and verged on hurtful and spiteful? When I sit down (finally … it always takes a while) to respond to Kathleen, I am forced to think about what really mattered about the intervening weeks. I think she gets a clearer view of my life for hearing about the things that mattered enough to commit to paper. And the little things that didn’t deserve to have more energy spent on them remain unwritten. Sure, we could print out the important emails in our lives and put them on a bulletin board. It’s just not the same. 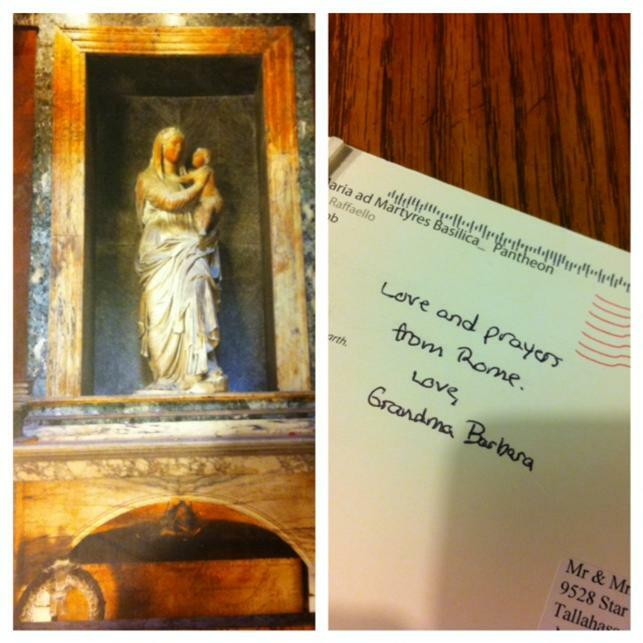 Fifteen days after my mother in law’s death, and about six weeks after receiving her postcard from her “bucket list” trip to Rome, I am so happy to have this little memento. She and I sat at her computer prior to her trip and went through her address labels so she could have them with her in Rome. I know she and my sister in law Mary went to special efforts during their trip to apply the labels, write a note, and get the special Vatican stamps. It is so much more meaningful than any email they would have been able to dash off. Thank you, snail mail, for being a way for us to carve out time for our friends. Is there someone you could delight with a piece of snail mail? Why not drop them a line? This entry was posted in Holy Comforter Episcopal Church Tallahassee, Mom's Monday Mingle and tagged Erma Bombeck, Rome, Snail Mail by Paula Kiger. Bookmark the permalink. I like that you still send letters, very true that they feel like a gift and physical memory of a connection w/someone. Plus can you imagine a world with just love emails and not love letters? That would be no good..
A world with no love letters would be a sad world indeed. Thanks for the comment! I love snail mail. It does feel like a gift. I am always excited when I get mail that isn’t a bill! I love this! I’m not the best letter writer, but even a couple of lines added to a greeting card can do so much to cheer someone! I send random greeting cards pretty regularly, I’m glad to hear someone else loves snail mail as much as I do! Exactly, Katie! It doesn’t have to be elaborate … just putting pen to paper! 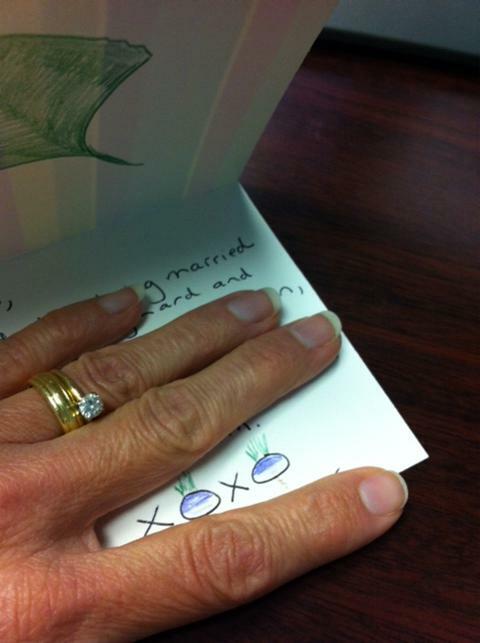 Glad to “meet” another snail mail lover, Linda! Thank you for your comment, Suzanne. Your snail-mail loving daughter is definitely on to something! Good reminder here, Paula. When our boys were at camp for two weeks, I sent each of them two long notes on small legal pad paper. They not only brought them home with them, I have found them stored in various places in their rooms more than four years later. I know they re-read them sometimes and that makes me so happy. They have also been known to send hand written thank you notes for gifts. Our younger son is so funny in his notes; people love to receive them in his unique writing and sense of humor. Thank you for pointing me in the direction of your blog. Hi Sarah! I apologize for the delay in responding to your comment; I just saw this! I just love that your boys are getting in the habit of sending hand written notes. There’s truly something special about them! You already know that I’m a fan of snail mail. I wish it wasn’t such a lost art. I am finding that there are people who still love it as much as I do, but they don’t even write as often or as much as I do. 🙂 I love connecting with people on a personal level. I feel that snail mail helps us to do that. It truly does. Nothing gives me a thrill quite like a piece of non-bill, non-junk snail mail — it means someone was very intentional in reaching out to me!